With thanks to Virtuella and Raksha. Aragorn stretched out his long legs and sighed as he picked up yet another document requiring his perusal and signature. He was interrupted by a knock on the door of his study. “Come in,” he called, expecting a servant with refreshments he had asked for. To his surprise it was his Steward. “May I ask a favour of you, my lord?” said Faramir. He respectfully dipped his head. “How might I help you, Faramir?” Aragorn pushed the papers to one side. He stood up to stretch his cramped limbs. “Sit down and be easy, I have sent for refreshments.” He gestured towards the couch on the far side of the room. “They always send me sufficient to feed a Hobbit or two!” He sat down again. Faramir sat, but failed to relax. “I am well, thank you, sire," Faramir said stiffly. Just then a servant arrived bearing a tray laden with food and drink. Aragorn helped himself to tea and cakes and gestured Faramir to do likewise. “You have travelled to Harad, have you not, my lord?” said Faramir. 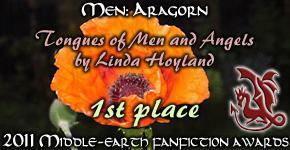 Aragorn nodded and looked at Faramir expectantly. “I understand if you are too busy to teach me, my lord. I will detain you no longer.” The Steward pushed aside his half eaten slice of cake and rose to his feet. Thank you, my lord. I am most grateful.” Faramir finished the cake, bowed low and took his leave. Aragorn sighed again when the door shut, this time in exasperation. He had only been king a few months, but already he was weary of all the bowing and scraping. He had told his Steward only to do it in public, but the man seemed deaf to his plea. And now this request to learn the tongue of Harad! Aragorn could only assume that, as usual, Faramir was diligent and eager to please in his duties. He could but hope that the young man would at least be able to get his tongue around a few simple phrases of greeting without embarrassing himself. He thought back to his own attempts to learn from a friendly trader who had roared with laughter at his pupil’s early mispronunciations. It seemed that instead of saying “Greetings, fellow traveller, where might water be found?” Aragorn had said, “Be gone, you louse, I am a fountain.” Aragorn still blushed at the memory. He inwardly vowed not to laugh at all the mistakes his pupil was likely to make. Why, he would even tell the young man about all his mistakes to put him at his ease! At least it was not a matter of life or death that Faramir should master the language. Aragorn had endeavoured to listen rather than speak during his time in Harad. When speech had been needed he had introduced himself as a merchant from Umbar to explain both his grey eyes and any mispronunciations he might make. How blessed they were that it was now possible to learn the language for pleasure and not as a grim necessity! Aragorn decided to be a diligent but kindly teacher to his Steward. He would gently correct Faramir’s mistakes and bolster his confidence by praising him if he managed to pronounce any of the difficult phrases correctly. Faramir arrived promptly for his first lesson. Aragorn decided to test his Steward’s aptitude for languages in general by greeting him in the tongue of Rohan. Faramir did not bat an eyelid but replied in the same tongue, with a perfectly executed greeting and enquiry regarding King and Queen’s good health and the health of his horses. Aragorn spoke slowly and carefully expecting to need to repeat the phrase several times before Faramir would venture to try it. Instead the Steward repeated it at once. “You only stressed the second syllable of ancestors when it should be the first,” said Aragorn looking at the young man in blank amazement. He repeated the phrase. This time Faramir spoke it flawlessly. By the time the bell rang for the midday meal in the Citadel Faramir had mastered all the greetings in the tongue of Harad as well as enquiries about the weather and the health of the guest and his family. Aragorn was relieved that it was time to eat as he was finding it increasingly difficult not gape open mouthed at his Steward. He supposed the young man simply had a good ear. Learning and remembering the complex phrases was another matter entirely. “Will you not need time to memorise the phrases you have learned today?” the King enquired. “I assure you I shall not neglect my other duties, my lord.” Faramir looked a trifle hurt. The next morning Aragorn greeted his pupil in the full expectation that they would spend the hour going over the same phrases but instead Faramir greeted him using one of the phrases he had taught him the day before. “May the sun never dazzle your eyes, most esteemed lord!” said Faramir, pronouncing the phrase perfectly. “I fear I have forgotten the last phrase that you taught me yesterday,” said Faramir looking rather displeased with himself. “You are only human,” said Aragorn, expecting that his Steward had forgotten more than one phrase, but no, Faramir recalled them all perfectly and eagerly learned many more. It seemed that the young man had a remarkable aptitude for languages, which rivalled that of his King’s! “I am just a little tired, Faramir, I am delighted with your progress,” Aragorn assured the younger man. “I shall have to give Faramir another lesson tomorrow,” Aragorn told Arwen after they dined that night. “Why are you so gloomy at the prospect? I thought you liked your Steward?” said Arwen. “But they were Elves, not Men. You are used to excelling amongst your own kind,” said the Queen. “I suppose I am,” Aragorn conceded. “And you do,” said Arwen. She moved closer to him on the couch and kissed him tenderly. Eagerly, he returned her kiss. “A handful of the wounded remained in the City,” said Aragorn. “I shall enquire as to their whereabouts. Yes, I do feel sorry for Faramir, he has endured things that no man should and he does not have such consolations as I do.” He kissed Arwen again and forgot everything save the joy of being in her arms. The next day Aragorn sent for Tarostar, the Warden of the Houses of Healing and enquired of him as to what had become of the prisoners from Harad. The Warden informed him that a few still remained within the Houses, their wounds having left them too severely crippled to travel home and having no place to go within the City. “I am hoping that the new Ambassador will do something to help these poor fellows, sire,” said the Warden. “Lord Denethor was a great lore master. He must have been pleased that his son followed in his footsteps,” said Aragorn. “Too many good men perished. I am glad that I was able to save one of them,” said Aragorn. “You saved the very best of them, my lord,” said Warden. He bowed and took his leave. Aragorn picked up a document from the top of the pile as soon as the man had left and stared at it unseeing. How could he resent Faramir’s aptitude for languages? He was as bad as Denethor! Aragorn thought of his childhood. A loving mother had raised him and Master Elrond had been the kindest of foster fathers. Not only had he been taught to fight as soon as he was old enough, but encouraged to learn the healing arts, as well as the vast lore that the libraries of Rivendell contained. Poor Faramir had been bereft of a mother at an early age, denied his father’s love and the scholarly pursuits that he craved. He had lost the brother he loved in the war and freely given up the rule of Gondor to Aragorn. Yet despite knowing all this, Aragorn still felt a nagging resentment that his pupil threatened to surpass him. Faramir received the suggestion that he visit the prisoners of war from Harad with more enthusiasm that Aragorn expected. Faramir continued to pick up the language of Harad with amazing speed while Aragorn endeavoured to teach him with as much enthusiasm as he could muster. Faramir had been visiting a native of Harad who had lost both arms and a leg during the battle for Minas Tirith. From what the King could gather of these visits from his Steward’s account, the man was unsurprisingly angry and bitter. Aragorn wondered if Faramir would learn anything from him at all. Of the other prisoners who lingered in the Houses of Healing; one had lost his wits, while another refused to converse with his captors. The young man who had agreed to talk to Faramir appeared to be so doing out of boredom rather than any desire to improve relations between the two realms. If this was how those they had tried to heal reacted, Aragorn wondered if it were a good idea after all to invite an Ambassador. But how could relations between Gondor and Harad ever improve if there were no contact between the two peoples? On the day of the Ambassador’s arrival, the King confided his apprehensions to his Steward and Faramir admitted that he shared them. Aragorn sat on his throne to receive their guest with Faramir seated in the Steward’s chair. Guards kept a watchful eye on the proceedings. The ambassador entered alone. He was a tall man with a black beard, olive skin and brown eyes.He wore flowing robes of purple and dark blue rather than the scarlet warriors' garb with which Aragorn and Faramir were both painfully familiar. The man prostrated himself low before the throne. “I should like to invite you to dine with me tomorrow and the fair blossoms of your garden to dine with my Queen,” said Aragorn. “I gladly accept your most gracious invitation, esteemed Lord King,” said Tahir. “Like you, I choose but one fair flower.” He bowed again and prepared to take his leave. “May the sun never dazzle your eyes, most excellent one until our next meeting!” said Faramir in the tongue of Harad. Tahir smiled and returned the greeting. “Maybe I should not have spoken to him in his language then?” said Faramir. In order to avoid any possible embarrassment to either side over the food being served, the dinner for the ambassador was an informal affair. The guests were served from dishes on a table at the side of the room and then sat in groups at small tables. Together with the Ambassador came several of his entourage, while Aragorn and Faramir were discretely accompanied by guards. Several lords and captains had also been invited to meet the Ambassador. Meanwhile in the royal couple’s private quarters, Arwen was entertaining the ambassador’s wife, aided by a woman from the Houses of Healing who spoke some of the Harradic tongue. Aragorn was glad of the catering arrangements he had chosen when he saw the Ambassador eagerly consuming large quantities of a spicy dish, which Aragorn recalled only to well from his travels. A single bite sufficed to set his mouth afire. King of the West instead of a lonely traveller, Aragorn smiled and quaffed some wine to cool his throat. The Southrons enjoyed their pepper even more than he remembered. He was glad to be able to turn his attention to the cold meats served in the Gondorian fashion. Faramir was doing likewise after a discreet word of warning from the King concerning the more exotic dishes on offer. “I will pay for them to continue to be cared for here,” said Tahir. “Would they not prefer to return home?” Faramir asked. Faramir repressed a shudder. Friendly and eager to please Tahir might be, but he came from a land whose invading warriors Faramir had fought since he was old enough to wield sword and bow. He had lost many good comrades to the warriors of Harad. An image of one of his Rangers cleft almost in twain by a Southron sword swam before his eyes. “I think I will have some dessert,” he said. “What shall I fetch you, my lord?” a hovering servant enquired. “I think I will stretch my legs,” said Faramir. The Steward wandered over to the table piled high with exotic fruits, custards and syllabubs. Faramir felt slightly nauseous at the memories that been stirred within him and was loth to eat any more just yet. Two of the Ambassador’s entourage were by the table chattering to each other in their own tongue. “Is your dagger sharp?” one asked. Faramir ignored them, assuming they were concerned about slicing fruit, but both men chose spiced custards to eat. Faramir realised to his horror that these two were planning to murder Aragorn. Trying to appear as nonchalant as possible, he picked up a peach from the table and made his way back to his place, never taking his eyes from the would be killers. "Shall I slice that for you, my lord?" asked a servant. "No thank you." Faramir brushed the man aside. Just then one of the Haradrim reached inside his flowing robes. "Guards, arrest those men!" Faramir cried. The guards raced to obey Faramir's orders. "This is an outrage!" the ambassador protested. "Release my companions at once!" "They plan to kill the King," Faramir cried. Hearing the commotion, more guards raced to the scene. They seized the ambassador and the remainder of his entourage. "How dare you?" Tahir protested. "We came here in peacefulness. We offer not harm to your esteemed majesty." "You call this no harm?" A guard held up a long handled curved dagger with a serrated blade. "It is punishable by death to carry a concealed weapon in the presence of the King." "Explain yourself, Ratib," said the ambassador sternly. "The enemy of the Lord of Gifts deserves to choke in his own blood!" said Ratib in his own tongue. "Let him perish as my brothers were slain!" "A curse upon him and all of his kind!" cried the second would-be assassin, while a guard relieved him of an equally evil looking blade. He spat in Aragorn's direction. "Mercy, most gracious and esteemed Lord King!" Tahir managed to break free from the grasp on the guard who was restraining him. He flung himself at Aragorn's feet.. "Let not your wrath fall upon my fair flower and fruits. Shave my beard and tear my robe, do with me as you will, but harm not them! Shame not my fragrant flower and let my sons live! They are but babes." "What do you take me for?" Aragorn asked angrily. "We do not harm innocent women and children in my realms. They will be shown more courtesy than you have shown us with your wicked plot." "I plot nothing. I want peace, between our lands friends. " Tahir's Westron became increasingly broken in his agitation. A sudden horrible thought struck Aragorn. The ambassador's wife was with his Arwen! What if her pregnancy were but a pretext and she was concealing weapons beneath the flowing robes that the Haradrim wore? "See that the prisoners are taken into custody," he ordered Faramir. With that he ran from the room, calling for more guards to join him. Aragorn drew his sword when he reached his apartments. "Wait there," he ordered the guards. He flung the door wide and hastened within calling his wife's name loudly. "Whatever is the matter Estel?" Arwen appeared from her private sitting room. "Where is the ambassador's wife?" Aragorn demanded. "Lady Adiva? She is resting. The poor woman should never have undertaken so long a journey in her condition, but she was eager to come her. She is interested in horses and is looking forward to seeing those of Rohan and Gondor. She already speaks our language well." "Her condition? She may not be with child at all, but instead be concealing weapons." "What nonsense, Estel! She permitted me to feel the baby kicking as well as Dame Ivorwen from the Houses. She was curious about my Elven abilities. I was able to tell she was carrying a strong healthy child who was eager to be born. Whatever is all this about? You will frighten the poor lady bursting in like this!" "She might well be frightened," Aragorn said grimly. "Her husband and his companions were planning to murder me!" "My husband is no assassin!" A foreign sounding voice called. Aragorn gripped his sword hilt tighter as its owner appeared, an olive skinned woman who waddled across the room in great agitation. "What have you done with my husband?" the woman asked. "Who are you?" "I am the King," Aragorn replied. "Your husband is under arrest, my lady." The woman gave a cry in her own language and sank senseless to the ground. Aragorn bent over her, looking concerned. Dame Ivorwen, together with a woman who appeared to be Lady Adiva's maid, came running at the sound of her cry. The maid, oblivious as to who Aragorn was, started screaming curses at him in her native tongue. Dame Ivorwen tried vainly to calm her. "She has fainted," said Aragorn. He scooped the woman up and carried her to the couch in Arwen's solar assisted by one of the guards. While the other women fussed around her, she opened her eyes and groaned loudly. Aragorn took Arwen to one side and explained to her all that happened. The Queen listened gravely, her eyes wide with horror. "It was when the so- called ambassador mentioned his wife that I feared you might be in danger," he explained. I shall send the woman and her children back to Harad." Dame Ivorwen approached them looking grave. "I believe the Ambassador's wife might be about to give birth, my lord, my lady, though I would need to examine her properly to be certain," she said. "She has started to have strong contractions." "I will bid the guards carry her on a litter to the Houses of Healing," said Aragorn. "Your pardon, sire, but I do not think she should be moved," said Dame Ivorwen. "I doubt she could reach the Houses in time and the journey would be most unpleasant for the poor lady." "She shall stay here of course," said Arwen before her husband could answer. Her tone permitted no argument. "I must return to the prisoners," said Aragorn. "My guards will remain in case of any threat to you." "Well, they can wait outside," Arwen said firmly. "Whatever her husband might have done, Lady Adiva deserves some privacy for the birth." "I ask you only to be careful," said Aragorn as he took his leave. Arwen returned to the solar where Lady Adiva lay on the couch .She was trembling. "There is no need to be afraid," Arwen said kindly. "Your baby will soon be with you." "Then what will become of us?" cried Lady Adiva. "I be shamed before my husband ere we die, and my precious jewels enslaved! My lord never hurt yours!" Arwen grasped the woman's hand. "The King would never abuse women and children thus, and your husband will be given a fair hearing. I place you and your children under my personal protection." "You are most gracious, esteemed Lady Arwen." Lady Adiva managed a faint smile. Meanwhile Faramir had personally searched the ambassador in deference to his rank and found no weapons on him. Neither had the guards found any further weapons on members of his entourage. Faramir told the guards to take the two would be assassins to prison, but felt loth to send the others there until he had consulted with the King. He now sat with Tahir in an anteroom near the reception hall. A guard was stationed outside, but the two were alone together. "I desire peace, I would not harm your esteemed Lord King," said Tahir yet again. He was less agitated now and was again speaking fluent Westron. "For my part, I sense no deception in you," said Faramir. "But if you desire peace, why bring two companions who would rob Gondor of her lord?" "I chose them not, exalted Lord Steward" said Tahir. "The Great Khan commanded I bring fourteen companions, two from each of our seven great tribes. I come from the tribe of Wakil, as does my fair blossom. Those contemptible sons of dogs are born of the Suhayb tribe. Maybe their leader want war within our lands as well as your esteemed lord's kingdom?" "I see," said Faramir thoughtfully. He knew all too well that there were rival factions within Gondor. Maybe the same was true of Harad? They still knew very little about their former enemies. When the Dark Lord had been overthrown, there had been a rebellion in Harad and the ruling Khan had been slaughtered and replaced with one of his former captains. It was with this new leader that a treaty had been signed. "What tribe was your former leader from?" Faramir asked. "The accursed sons of Suhayb," Tahir replied. "And the Lord who rules Harad now?" "He is of my tribe, his father's uncle and my father, may their souls dwell forever in the shade of the oasis, were brothers, most esteemed Lord Faramir." "I see," said Faramir. Everything suddenly began to make sense. "Unless the King decrees otherwise," he said, "I place you under house arrest until we ascertain the full truth of this matter. I believe you to be innocent of plotting against the King, but I will take no chances with my lord's well well-being." "Nor should you, esteemed lord," said Tahir. "May the sun's rays never burn you." A few hours later, Lady Adiva was sitting propped up in bed in a guest chamber in the royal apartments, clutching her tiny newborn daughter. The baby was a little early, but strong and healthy. "She is beautiful," said Arwen. "You have been most kind, gracious Lady Arwen," said Adiva. "Alas, that she will grow up fatherless!" Just then a servant tapped on the door, "The Ambassador asks if he might see his wife?" she said. "The King has released him in order to visit his wife." "Let him enter," said Arwen. "How is my fair flower, esteemed Lady Queen?" asked the Ambassador as soon as he was allowed through the door. "She is well," said Arwen bristling slightly at the man. She had heard that the men of Harad were unloving husbands who treated their womenfolk worse than their beasts. "You have a daughter," Arwen sounded rather defensive. "A fair and healthy child whom you can be proud of." "A daughter! Long have a desired you a priceless treasure, exalted lady, but I am glad I was not granted such until the days of peace where she can flourish and blossom as she ought." "Tahir!" cried Lady Adiva at the sound of her husband's voice. Arwen turned to look at her and perceived tears of joy were running down the lady's cheeks. "My dear love, fairest of flowers! All is well. The exalted Lord Elessar believes my innocence. I shall gift you the finest mare to be found in this land for giving me this fair blossom!" Tahir ran towards his wife. Arwen retreated to the far side of the room and gazed out of the window for a few minutes while the couple were reunited and chattered in their own tongue. "Esteemed Lady Arwen?" Adiva called after a few minutes. Arwen returned to the bedside. Tahir bowed low to her. "My fair flower and I would consider it the highest of honours if you would choose a name for our child," he said. "The honour is mine." Arwen studied the infant's features for a moment or two and then said. "I name her Elwing after my grandmother." Lady Adiva beamed. "The name is pretty," she said. "May your grandmother always dwell by an oasis!" Aragorn was trying to decipher an almost illegible document concerning levies on imported grain the next morning, when a knock on his study door interrupted him. Faramir entered and bowed low. "I have completed the report you requested concerning yesterday's incident," he said. "I have not yet had a chance to properly express my gratitude," said Aragorn standing up and warmly clasping Faramir's hands. "You saved my life yesterday with your quick thinking. I am in your debt." "It is my pleasure to be of service, sire," said Faramir colouring slightly at the King's praise. "One thing surprises me," said Aragorn. "How did you know the words used in Harad for things like "dagger" and "blood"? I taught you formal courtly greetings, which are not remotely bloodthirsty!" "I have poor Utbar in the Houses of Healing to thank for the knowledge," said Faramir. "He was none too happy at being asked to talk to me and delighted in telling me in gory detail what he would like to do to his enemies if his limbs were sound. I could only pity the young man. He cannot have seen more than twenty spring times and now he can never walk beneath the trees nor embrace a sweetheart." "I shall see he is well provided for rather than expecting the Ambassador to pay for his care," said Aragorn. "The young man has unwittingly done great service to Gondor." "I intend to continue visiting him," said Faramir. "By my third visit he ceased to curse and was, I believe grateful for someone to converse with, even a former enemy. I am so grateful that you taught me the tongue of Harad, my lord, it has proved most useful." "You are a pleasure to teach," said Aragorn and this time he meant it from the bottom of his heart. What did it matter if a pupil surpassed their teacher? Lore and learning were treasures that should be shared.